Download "Course Outline. 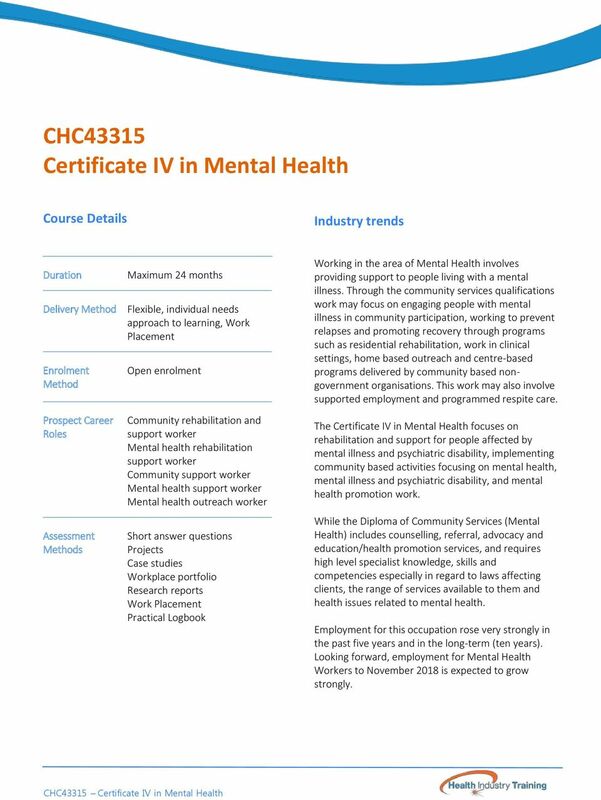 CHC43315 Certificate IV in Mental Health. 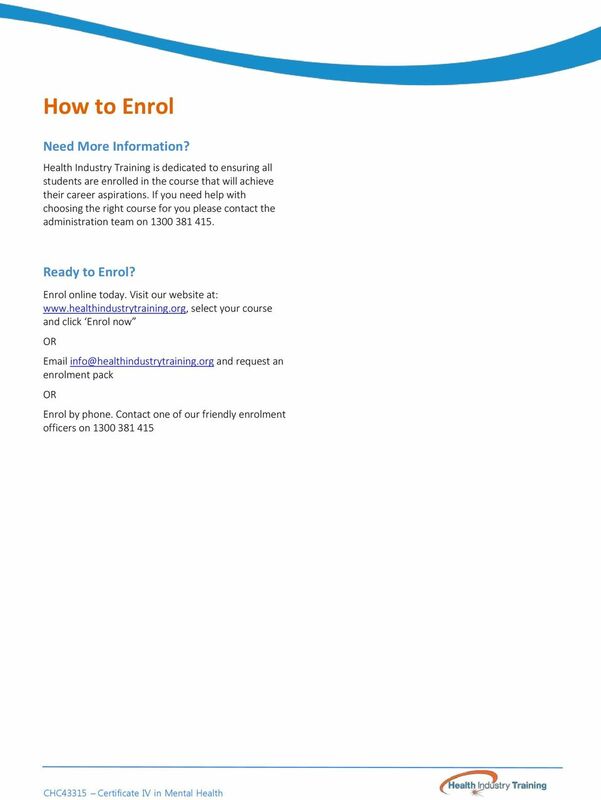 CHC43315 Certificate IV in Mental Health"
3 CHC43315 Certificate IV in Mental Health Course Details Industry trends Duration Delivery Method Enrolment Method Prospect Career Roles Assessment Methods Maximum 24 months Flexible, individual needs approach to learning, Work Placement Open enrolment Community rehabilitation and support worker Mental health rehabilitation support worker Community support worker Mental health support worker Mental health outreach worker Short answer questions Projects Case studies Workplace portfolio Research reports Work Placement Practical Logbook Working in the area of Mental Health involves providing support to people living with a mental illness. 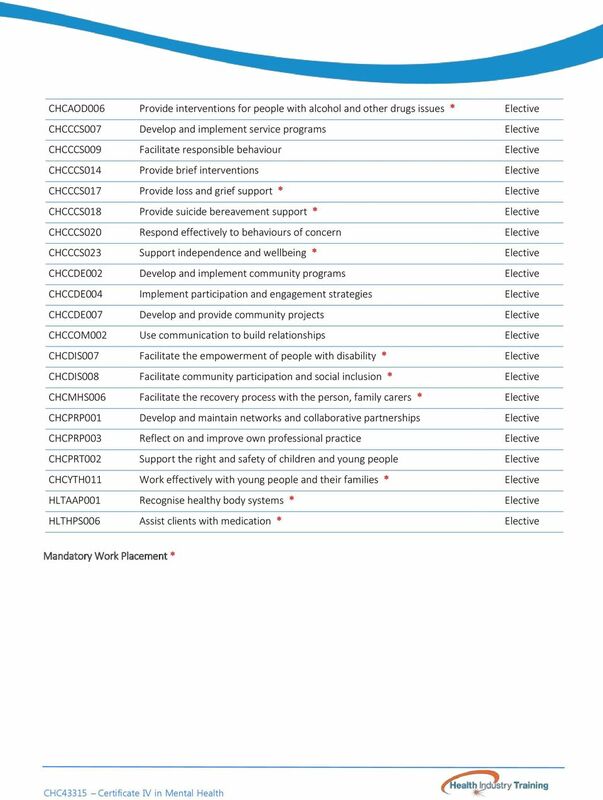 Through the community services qualifications work may focus on engaging people with mental illness in community participation, working to prevent relapses and promoting recovery through programs such as residential rehabilitation, work in clinical settings, home based outreach and centre-based programs delivered by community based nongovernment organisations. This work may also involve supported employment and programmed respite care. 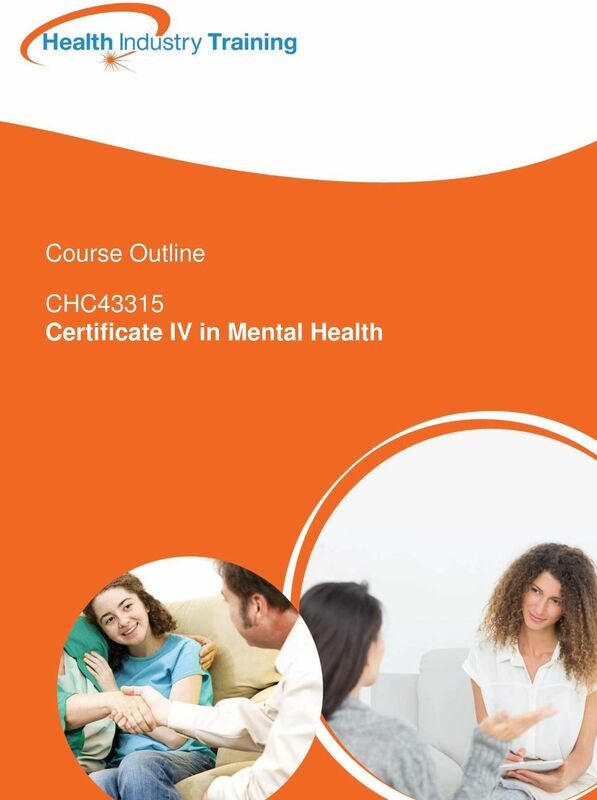 The Certificate IV in Mental Health focuses on rehabilitation and support for people affected by mental illness and psychiatric disability, implementing community based activities focusing on mental health, mental illness and psychiatric disability, and mental health promotion work. 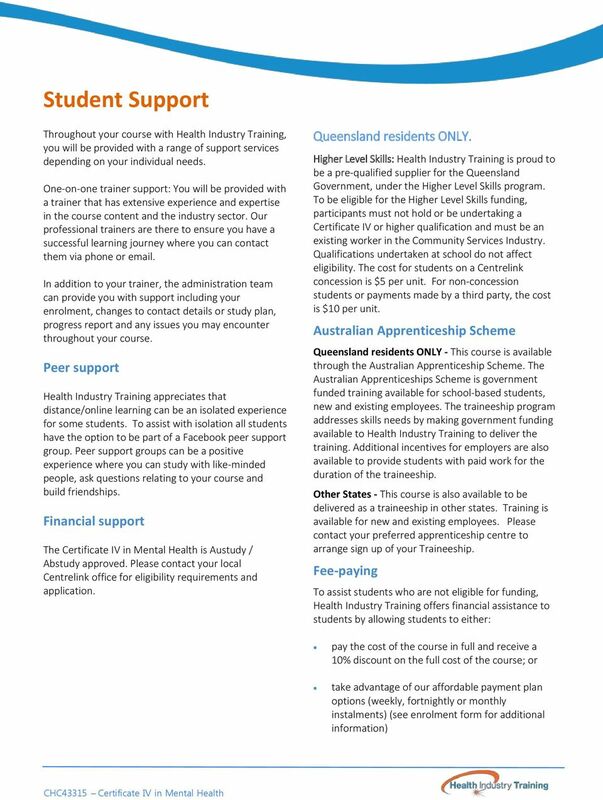 While the Diploma of Community Services (Mental Health) includes counselling, referral, advocacy and education/health promotion services, and requires high level specialist knowledge, skills and competencies especially in regard to laws affecting clients, the range of services available to them and health issues related to mental health. Employment for this occupation rose very strongly in the past five years and in the long-term (ten years). Looking forward, employment for Mental Health Workers to November 2018 is expected to grow strongly. 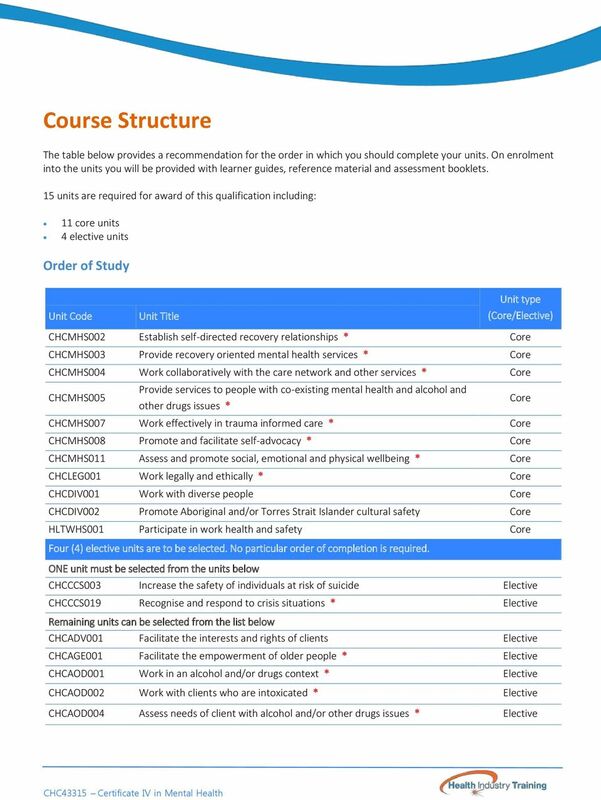 4 Course Information Delivery Method The Certificate IV in Mental Health is delivered through a blended delivery method. 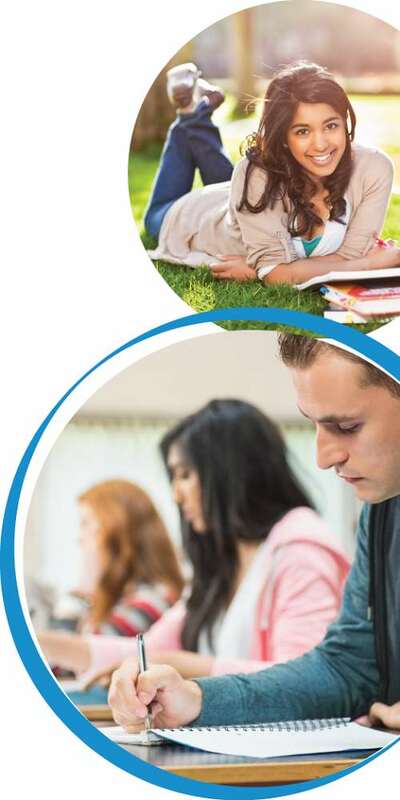 You will be provided with a Learner Resource and Assessment Booklet for each unit of competency Assessments are to be completed in normal word document attached to an and sent directly to your trainer for all theoretical assessments. It is a requirement of this qualification that you will undertake work placement. This will provide you with the necessary practical skills and workplace experience. Demonstration of performance will be provided through a practical logbook to ensure students are fully equipped to enter the workforce after the completion of the qualification. Work Placement Duration: Time is based on tasks required to be completed through a log book Work placement outline Health Industry Training recognises that an important part of undertaking a qualification in health or community services is the practical component of the course. Work placement provides students with an avenue to apply practical skills in a real life environment where you are able to practice the skills and knowledge you have learnt during the course. 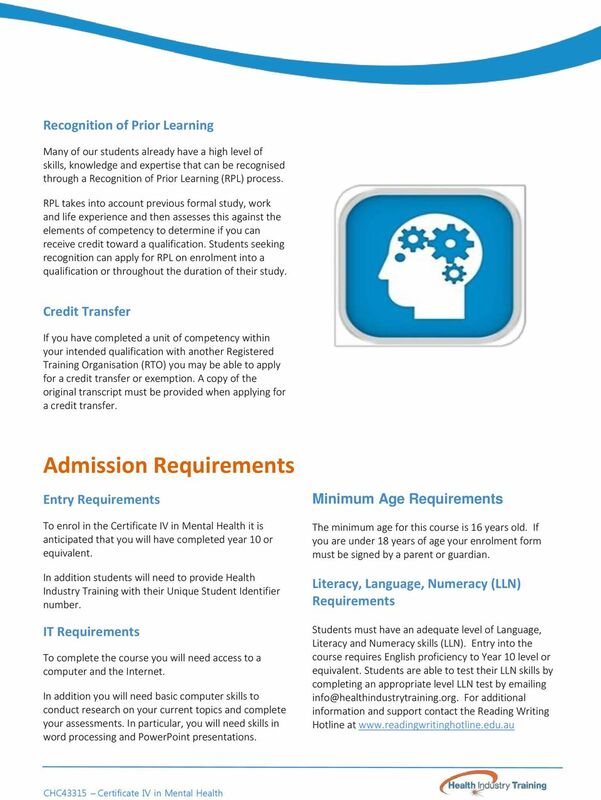 It is a requirement of this qualification for students to undertake work placement for the Certificate IV in Mental Health. 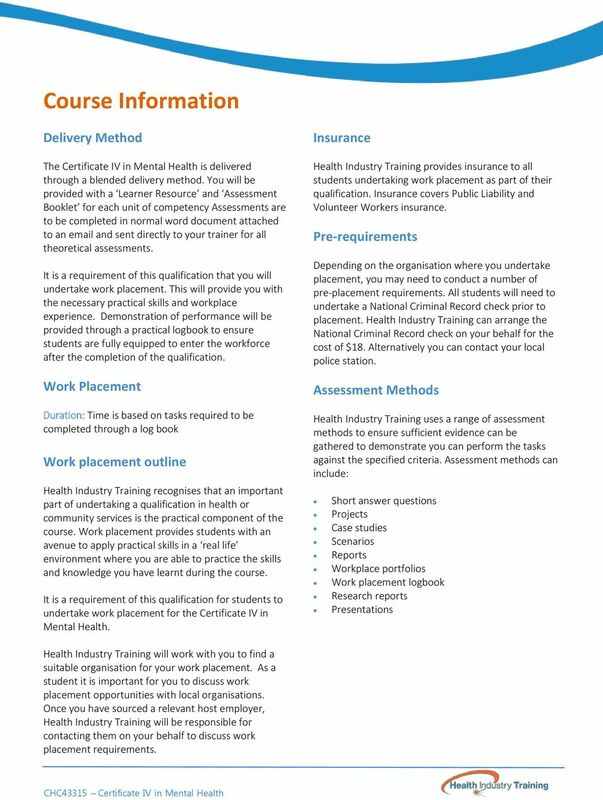 Insurance Health Industry Training provides insurance to all students undertaking work placement as part of their qualification. Insurance covers Public Liability and Volunteer Workers insurance. Pre-requirements Depending on the organisation where you undertake placement, you may need to conduct a number of pre-placement requirements. All students will need to undertake a National Criminal Record check prior to placement. Health Industry Training can arrange the National Criminal Record check on your behalf for the cost of $18. Alternatively you can contact your local police station. Assessment Methods Health Industry Training uses a range of assessment methods to ensure sufficient evidence can be gathered to demonstrate you can perform the tasks against the specified criteria. Assessment methods can include: Short answer questions Projects Case studies Scenarios Reports Workplace portfolios Work placement logbook Research reports Presentations Health Industry Training will work with you to find a suitable organisation for your work placement. As a student it is important for you to discuss work placement opportunities with local organisations. 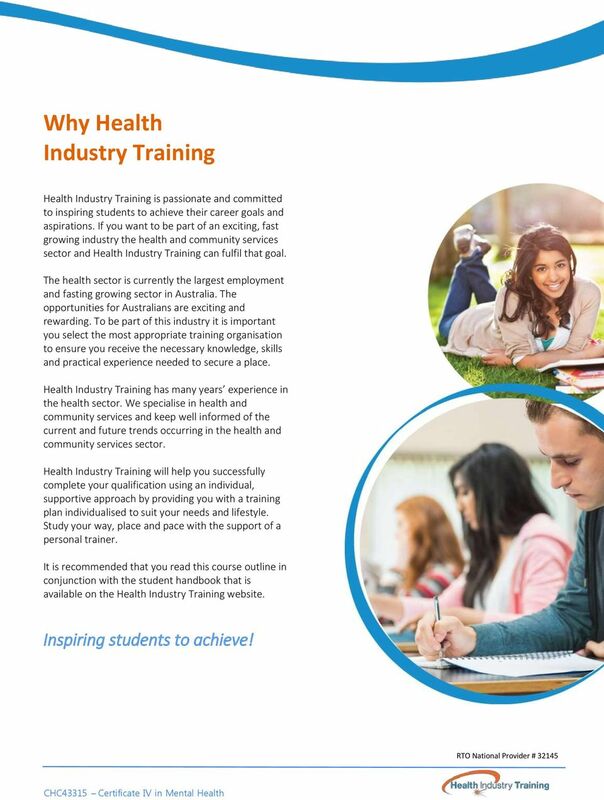 Once you have sourced a relevant host employer, Health Industry Training will be responsible for contacting them on your behalf to discuss work placement requirements.